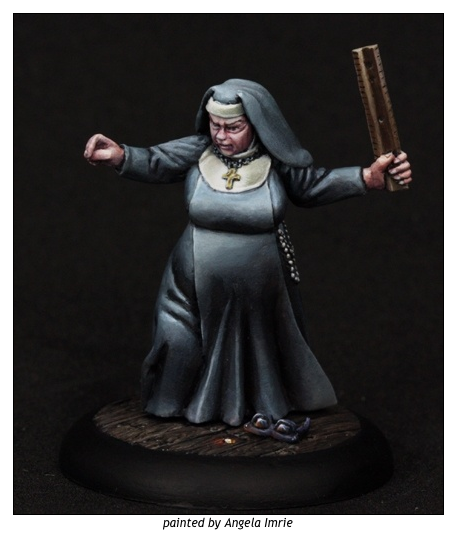 Here is a fantastic shot of a piece I sculpted for Reaper's Chronoscope line - Sister Maria. Since this is still Lent for some of you and Easter is a few of weeks away, I wanted to spotlight the fantastic job Angela Imrie did painting this figure. Angela asked me during last Reaper Artist Con if I would sculpt a little pair of Wayfarer sunglasses in order to make a nod to the Blues Brothers. How could I refuse? 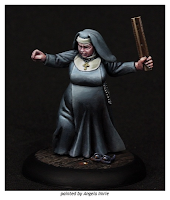 So, if you're feeling in the Easter spirit and you have fond memories of getting smacked by rulers as a child (like I do) grab a copy of Sister Maria and paint her up for the holiday!